Nancy Stoyer, ’88, enrolled at Stanislaus State as a math major, but — like many students — she knew she probably was going to change her major. She found physics and chemistry as appealing disciplines, and after taking several chemistry courses she settled in to pursue her undergraduate degree in the field. Stoyer said it was the relationships she built with her professors that stood out the most from her time at Stan State. In fact, it was the encouragement of her undergraduate mentor, Professor Hobart Hamilton, that resulted in her application to graduate schools and eventually her acceptance to UC Berkeley. Stoyer also was urged by Hamilton to attend summer programs at Argonne National Laboratory and Argonne National Laboratory - West, in Idaho Falls, Idaho. There she worked in the field of nuclear science, which has become the focus of her work ever since, leading to her earning her Ph.D. in Chemistry from UC Berkeley with a focus on nuclear science. Shortly after leaving Berkeley, she joined Lawrence Livermore National Laboratory (LLNL) as a nuclear chemist working on several projects, include some that involved matters of national security, nuclear non-proliferation and counter-proliferation, and military reach-back. She also was a part of the heavy element group at LLNL and the Dubna-Livermore collaboration, which resulted in the discovery and naming of element 114, flerovium, in 1998, and element 116, livermorium, in 2000. While the importance of the discoveries of these elements may yet be unknown, Stoyer described partaking in the process of discovery — seeing something new for the first time — as an integral part of the human experience. After leaving LLNL in 2008, Stoyer volunteered at an elementary school and discovered a new love. Pursuing her newfound desire to teach, she entered into an internship program that would allow her to teach and earn her credential simultaneously. Just three months into the program her plans were derailed when she was diagnosed with breast cancer. Though she did not complete the credential program, she continues to find ways to share her passion for science with students. She returned to LLNL in 2012 as a part-time consultant, which allowed her to dedicate time to speaking in 5th grade, 8th grade and high school classrooms about chemistry, nuclear science, the periodic table and element discovery. “What I want the students to learn is that science is not something to be afraid of, that it is always moving and growing,” she said. She also shares a little bit about the processes that were used to make the atoms of flerovium and livermorium. 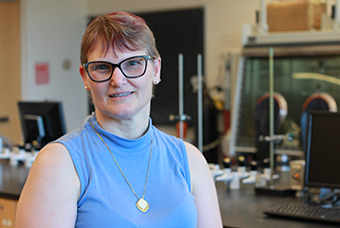 By sharing her knowledge and experiences in classrooms, Stoyer hopes she might be inspiring the next generation to pursue scientific discovery. Stoyer also recently served as a panelist for a Stanislaus State Alumni Association Career Connection event, sharing her passion for science with students at the University — many who are planning to pursue careers in science or science-related fields. “If I can inspire a student to continue to pursue their interest in science that would be fantastic,” she said.